Air Conditioner Air Filter – Which Way Do The Arrows Point? In Or Out? Which way do the arrows go when installing an AC air filter? I noticed my AC was running longer and not as cold as usual. I checked the air filter and found it to be caked with dust. I am going to replace the air filter because a new one will help the AC to run more efficient. I have a brand new 3M Filtrete air filter. It is the right size for my AC which is 14 x 30 x 1. I have removed the filter cover and threw the old air filter away. Now my question is, which way do the arrows need to be pointing? I do not want to install the air filter backwards. Do the arrows go toward the inside or point toward the outside? There was dust and dirt on the filter facing to the room not to the duct. I am confused which way to point the the filter. Which Way Do Arrows Point On Air Conditioning Air Filter? 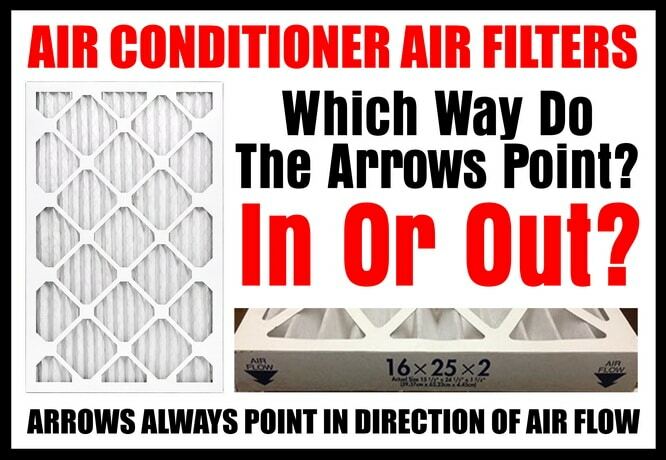 ANSWER: THE ARROWS ON ANY AIR FILTER NEED TO POINT IN THE SAME DIRECTION THE AIR IS FLOWING. For any air filter, whether it be for an air conditioner or a furnace, the ARROWS ALWAYS POINT IN THE DIRECTION OF AIR FLOW. When you install a new air filter into the AC return duct, the arrows face inward to specify which way the air is flowing. The return duct in your home is PULLING in air. When the air is being pulled or sucked in, the air filter arrows need to point INWARD, towards the duct. AC Air Filter Installed Backwards? If you install your home AC air filter in backwards, the filter will not work as intended. An HVAC air filter is made so one side has a filtering material and the other side has material to strengthen the filter. If the filter is installed backwards, dust and dirt can get sucked into the AC unit and damage it. If the filter is backwards, pieces of the actual filter can come off and get sucked into the unit and damage the blower fins. Always install the air filter with the arrows going INTO the duct. Dirty Air Conditioner Air Filter? Remember to replace your AC air filter on a regular basis, every 30 days or so. Even sooner if you have multiple pets in a small home or apartment. Animal hair and dander can clog an AC air filter fast, so replace more often. 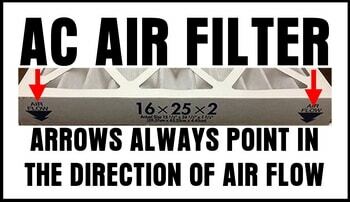 The dirtier the air filter, the more it restricts the air flow to the AC unit. The more restricted the air flow, the less efficient the AC will work. This means the AC unit has to run longer and work harder to get to the desired temperature. Your electricity bill will be higher and the AC unit lifespan will be shortened. Correct Size AC Air Filter? You also want to be sure you are installing the CORRECT SIZE AIR FILTER. If you install a smaller air filter, the dust and dirt particles will travel around the filter and go straight into the AC unit. The unfiltered air will always choose the path of least resistance which means the filter will be completely useless. The dirt, dust and animal hair that go around the filter will attach to the internal parts of the AC unit or furnace. This will make the unit less efficient and over time will cause mechanical failure of parts. This means air conditioning or furnace company service calls and expensive repairs. Here is an AC Air Filters Size Chart Guide to use when you need to find the correct size air filter for your home. If you need help finding the correct air filter size or have a question about certain brands or air filter arrow direction, please leave your comment below and we can help. Place the arrow toward the furnace. It should say toward furnace not have an arrow. Previous post: How Many BTUs Will You Need To Cool A Room With An AC?